My goal is $1200 for the day. Today I grossed $1575.00. 2. Knew where I was. Location. 3. Went with the trend. 4. Let the trade work itself out. 5. Had profit & costing stops in place. 7. Moved profit stops in just in case it didn't work out. 8. Planned trade, traded plan. 1. Took too big of a position. 24 contracts is way too many at any one time. 6 is stretching. 2. Was not at the computer when trades executed themselves to get out of trade. 3. Verbalization should be done on a normal level. 4. Need to see what is really going on before reashing entering a trade. My goal is $700 for the day. Today I grossed $937.50. 1. Was patient to wait for the setup of trades. 2. Stopped trading once my goal was met. 3. Verbalized my trades (whispered). 4. Planned my trade, traded my plan. 5. Knew where I was. Location, location, location. 6. Did not fear, but kept focused on each trade independently. 7. Was unemotional. Would not allow myself to be baited into controversial things. 1. Was not super focused. 2. Kids all over the house, fighting, very distracting. 3. Talking to my dad, so was very distracted. 5. Exceeded my original $300 net cost at any given point in time. My first trade was -$437.50. 6. Did not get out of my only costing trade when it originally broke against me. So, got out too late. 7. Did not stop trading even after I reached my goals. Wanted to make a few extra bucks and did. Once again, I am dealing with clutter. It seems like even as simply as I attempt to live, clutter is still an issue. My home is not very big, so I have to be very aware and mindful about clutter, as even a little bit of stuff can make things seem way worse. Today my kids and I spent time going through their clothing and they with their toys. We got rid of and donated a bunch of things, but this is just a start. My living room has looked far too cluttered, as well as the rest of the rooms in the house. Anyway, one of the things I also have is financial clutter, so over the next 3 months, I will be working to reduce my financial clutter, as that is a bit more challenging to do than to get through clothes and get rid of things that no longer fit or do not want. This week, outside of trading, I will be working on decluttering my home so we can have more room to allow God to just really pour into our lives more abundance. I will also begin working on taxes, which this is a lot to do here. I may also go through my books in the next 3 months and begin selling the books I no longer need on eBay, half.com or amazon marketplace. Why clutter up my place and mind with things that no longer benefit me? No point. 1. Get all taxes done and filed with the IRS ASAP. 2. Consistently make $2K/trading day and trade every day no matter what. 3. Keep my business & personal financial documentation organized. 4. Keep costing trades down and daily set a net limit on drawdown. 5. Be able to hire a business consultant to come in to help me be more successful in how I run my trading business, perhaps expanding it to teaching classes, DVDs, a more functional website. There were 3 trading days since 10-Nov-2008 that I could've trade but did not. Two of them were days after major holidays. The other was after having a huge drawdown and I needed to get my mental act together. I am very thankful I was able to pull myself out of that drawdown and really get back on track. With trading during personally emotionally times and too many things on my plate to do, I can see I've had more costing days than I'd like. Overall, my track record is still better than a lot of people's. My goal is steady progress in profitability rather than some huge profitable days followed by big costing days to make small gains. That is just emotionally not good to do. Since I have too many emotional challenges, continually making positive progress and keeping the negative small and managable is a goal of mine, as I heal/recover from my divorce and the financial challenges I've been faced with. My goal is $700 for the day. Today I grossed $800. 1. Knew where I was. Location, location, location. 2. Stopped trading when I reached my goal. 4. Got out of trades when they turned against me to take profits. 1. Did not verbalize trades. 2. Got out on a retracement rather than wait it through to take greater profits. Got anxious to take profits. 3. Did not fully plan my trade nor trade my plan. 4. Was distracted by my children and other things. 5. Multi-tasking, which did not allow me to focus. Notes: This was Christmas week and we had a lot of stuff going on. It was a super emotional week. I only traded 3 days this week, but had the opportunity to make it 4 days, but chose not to trade on Friday as I too many things going on and just didn't feel like trading. I'm thinking I may not trade this Friday, but it will really depend. My kids have got a lot of toys from family and friends, and I'm overwhelmed with all the stuff they have. We will need to go through their toys & clothes and donate or give away things they no longer need. It will be time later this week to take down the Christmas tree. I might as well start on some Spring cleaning of things early, as I have a lot of papers in my storage room from when I was an engineer that I ought to just send to the shredders to make room or just declutter. This week, my focus will be get my personal taxes squared away, which there is a lot of work. And to begin better organizing my business documentation. All of this cannot be done this week with further social things going on and my kids at home all the time. We did not get to go on the vacation we were hoping, because there are a lot of financial issues I must deal with. Maybe when all this is cleared up, eventually we can take a real vacation, but for now, finding little bits of time here and there, basquing in the moment, and just letting God give me daily mini-vacations will have to do. My goal is $700 for the day. Today I grossed -$1075. 5. Forgot to set a limit on my costing trades and overall costs I would take. 6. Did not plan my trades. 7. Kept trading when I should have just stopped. NOTES: I don't know that I did anything right on this trading day. 1. Verbalized trade some of trades. 2. After the first few trades, got out of costing trades quicker when they turned against me. 3. Patient with some of my trades. 4. Took profits when they were there or when I realized they would not come anymore. 5. Knew were I was - location. 7. Stopped trading once my goal was met. 8. Mentally cleared myself as best I could. 9. On some trades, focused on a good trade, not the money. 1. I was not patient with all my trades and the profits, had I waited, would've come and it would've been triple plus what I actually did with fewer trades. 3. Was not as patient as I intended to be. 4. On some trades, focused on the money, rather than good trading. 5. Distracted by my kids. 6. Forgot where I was locationwise on a couple trades, which led to overtrading. 7. Did not verbalize all my trades. My goal is $500 for the day. Today I grossed $700. 3. Allowed the trade to work. 5. Stopped trading when goal was reached. 6. Planned my trade. Traded my plan. 7. Recognized I was still pretty tired and decided to keep number of trades down. 8. Recognized my kids were home, so focus was minimal. Did not keep trading, though, I felt inclined to. 9. Knew where I was. Location, location, location. 10. Focused on what I could do at the moment. 2. Eat healthier foods during this holiday time. 3. Over committing my schedule can be quite bad for trading as it increases stress. Notes: Monday I was super focused to makeup for basically biting the dust the Friday before. It goes to show that I CAN be really focused. However, the remainder of the week my focus was not there, as I was all over the place in things. I recognized my kids had a lot of things going and the stuff with my former spouse has not been good. Defintely I need to master emotional resiliency so I can focus on the things I really need to attend to and not waste energy on things like my former spouse or people who want to derail me, or circumstances that come up. I've been so emotional it has definitely not been funny. My goal is $500 for the day. Today I grossed $125. 1. Got out of costing trades quickly. 3. Planned my trade, traded my plan. 4. Though I did not meet my goal, I saw that my thinking was way off and just decided to stop. It felt like I would incur more costs if I kept trading. I did trade on Friday and today, just not really all that much. I do have the results as soon as I journal them, which I have not yet. Been super busy and hardly home. I made one trade today and met my goal. That's all the trading for today. Will update later tonight last week's stuff and today's. If not, it will be tomorrow. I'm exhausted. My goal is $500 for the day. Today I grossed -$300. 2. When trades broke the trend, I immediately got out. 3. I stopped trading when I realized I couldn't get my focus. 4. I had a $300 limit as to what I was willing to take as costs and stopped trading when that limit was reached. 5. I went to go get rest and settle my mind, instead of continuing to trade in the state I was in. My goal is $500 for the day. Today I grossed $3100. 2. Did not trade with real funds since I'm really quite out of sorts. My practice HAS TO BE good before I put on funded trades. 3. Read the price action, market correct. 1. I had my stops in place, but something glitched with my trading software and took out my stops without really taking them out. Once I got them in place, I would've been out at a good profit, better then where I got out, which is still a profit, but I didn't bother to check. 2. I would not be able to hold overnight as I did for these trades in my real account, as the margin requirements are far different than for daytrading futures. 3. Gotta make sure all my i's are dotted and t's are crossed. 4. I also forgot I actually had trades on. That's NOT good. That is not taking one's money seriously. In practice you gotta do the same thing as real life, otherwise, when I switch to real life, I do what I did in practice. 5. Though the market rewarded me, these are things I need to pay careful attention to. Notes: I was away from the market during normal trading hours. I would not have put on any funded trades without being able to attend to them 100%. I will be doing funded trading Thursday. My goal is $500 for the day. Today I grossed -$1412.50. 1. Kept my word to trade daily no matter how I feel or what is going on. 1. Only got 3 hours of sleep last night. It was not because of the kids or anything. I was just wired and had a challenging time falling asleep and then awoke wide awake way too early. I was feeling so out of it. 2. Emotionally not real well focused and need to focus before trading. Yesterday is proof of what can happen if I really focused and keep my opinion out of things, and of course, God empowering me to see what I need to see. 3. Did not get centered before trading. 4. Did not verbalize trades. 5. Did not trade my trading plan. 6. Did not carefully plan my entry & exit. 7. Set too many stops and got filled for a position I didn't mean to get filled. My goal is $10,-00 for the day. Today I grossed $11,997.50. 1. Remained calm, clearheaded. Focused on trading and not other things. 2. Planned my trade, traded my plan. 4. Waited for good entries. 6. Spent time with God last night, focusing on what God could do in my life, rather than my circumstances. 7. Let go of things I could not control. Let go of anger. Forgave. 9. Kept peace in my household. 10. Used a combination of timeframes: 15, 30, 3 and 1 min. 11. Saw the big picture. I would like to add for any new readers, this is not a typical trading day for me. Because I had such a huge drawdown on Friday due to a host of errors on my part, I decided to make my goal big today and exceeded it. The results I'm showing are from all trading I do for the day and is usually a combination of practice and funded trading from several accounts. Notes: Well, basically Friday's performance wiped out the cumulative net of about $9300 to end at a cumulative a little over -$800. Pretty discouraging, eh? Now you wonder why I didn't want to really evaluate last week. Those are the cold hard facts. So, let this serve as a lesson to my readers. It all boils down to psychology and whether you can really trade or not. I have a lot of crap going on my life with my former spouse and as long as I don't deal with him, it's okay. However, it's hell when I have to deal with him. It resulted in me being incredibly angry, which was the 2nd week of anger at him. It resulted in 3 consecutive sleepless nights because somehow my anger caused spiritual things to happen in my household to wreak havoc with my children. Yes, that does sound bizarre, but how else can I explain my son puking in the middle of the night for 3 nights, but no fever and being totally well to go to school the next day? It wasn't pretty. Dealing with my former spouse and his insanity also impacted my weekend and it was super emotional. I finally realized once again that he will always be the way he is, and I have to accept it, let it go, let God deal with him and break him down. In the meantime, let God work on me, and not giving Satan any foothold in my life to work, which I did with all that anger. So, letting go. This week I'm choosing no matter what threats or his antics, to just really lay all of that before God so I can get back to business with my trading and not go through these rollercoaster days. They are really a challenge to emotionally deal with. My desire is to steadily make money every single day and to net a profit daily to meet the needs of my kids and I, pay off all our debts/taxes/bills and begin building my wealth accounts so I can have multiple streams of income through real estate, other businesses. I'm learning to be a duck and let things roll off my back. I realize he knows how to push my buttons, so this means I have to keep heavily connected to God, so He gives me discernment and wisdom on what is going on and help me to have self-control. God is in control. My goal is $300 for the day. Today I grossed -$10,100.00. 1. Had my stops in place, though, not as appropriately set. It could've been far worse. 1. Too many positions on. 2. Mentally/emotionally really out of it. 3. Walked away from trades, though, that is okay, but stops should've be much closer. 4. Listened to trading friends in their conversations, read some news, so I THOUGHT the market would further tank. I love a bear market and the market did not tank on my bearish positions. 5. Disregarded my indicators, even though they said things looked bullish or that the bearish was at a bottom. 6. Did not verbalize trades. 7. Not focused. Very distracted. Thinking about the money. I'm so sorry. I said I would have the analysis done for last week today and it's not. My mind has been preoccupied with a lot of other things right now. Basically big time holiday blues. Has nothing to do with trading. Anyway, it's on my "to do" list among the many other things I have going on this week. My goal is to trade every day this week. Hopefully I can keep focused enough to do this well. Stay tuned. I believe I ended in the negative last week. Traded 2 days with profits, 1 day no trading, and 2 days negatively. Ended Friday negatively and I think it wiped out my 2 profitable days and then some. Haven't done the analysis yet as I've been super busy. Here's what happened on Friday. On Thursday evening I began reading some of the opinions of some of my friends on what they thought would be an ugly Friday. Of course, I LOVE bearishness in the market. Yes, call me sadistic or something. 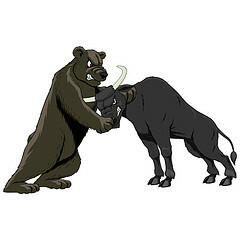 Friday was a busy day, but I put on a bearish trade or 2 or 3 with some big stops, as I thought they wouldn't get hit. Anyway, they got hit and I got hit hard. Those big stops would be both on the profits and costs. I EXPECTED more bearishness from the news of the day, but the market rebounded from Thursday's action. I wasn't around to find out why, as I set my stops and went to go do my Friday stuff. Well, to my dismay when I came home, my positions were all closed at BIG COSTS. Quite a few lessons here. Normally I set my stops (profits & costs) closer. I did not as I wanted to give the market room to work. It worked, just AGAINST me. I listened to other's opinions, rather than just look at the technicals. The technicals did give more bullish action than bearish, so having bearish positions with huge stop costs was NOT a smart idea. I saw these things before I left my positions to fend for themselves. Well, another hard lesson to learn. Better to learn it on a small position than a large one. Got lazy and went against my trading plan. The market did not reward me, which is a good thing, as when you do wrong things and get rewarded, it just puts you more in a gambling mentality to do it again. I got slapped big time. Ouch! I hope to have the analysis done tomorrow evening for Friday and a summary of last week. The market every day is great, regardless of what I do. Wasn't going to trade, but I did. I started yesterday, though. My goal is $300 for the day. Today I grossed $362.50. 3. Set my stops: profits & costs. 4. Knew where I was. I'm sorry but at least today and tomorrow, I will not be trading. I've now had 3 nights of hardly any sleep (had a total of almost 8 hrs of sleep in the last 3 days). My head hurts big time from sleep deprivation, totally exhausted. Though I'm forming the discipline of trading no matter what, probably at this state, I need to just say take care of my health. Since I had such a big draw down yesterday and was not able to recoup, attempting to trade today would mean more costs and put me in a further funk than I'm already in. When I was 20, I could pull this off much easier, but now? Nope. I'm going back to bed for a couple hours, go meet my therapist and then go do mommy duties. Hopefully by Friday I will be back on track. Though I cannot catch up on lost sleep, if I can get enough sleep these next 2 nights, I will be back in business to trade on Friday. My goal is $300 for the day. Today I grossed -$775. 1. Verbalized trades to get out of costing trades. 2. Set my stops to take profits and costs. 3. Made my goal small today, since I haven't slept hardly in 2 nights. 1. When it begins looking like I'm in the wrong direction, get out, instead of allowing myself to be taken out of the much bigger cost. 2. When I'm very sleep deprived, not just one night but multiple nights, probably need to set my goal to much less, like 1 contract at $100 for the day. 3. Was not as focused as I needed to be. Hands were feeling shakey literally, meaning my body is physically in overload. Probably not a good time to have too high expectations. 4. Used the wrong timeframe, using 1 min. rather than using 15 min., which is probably where I needed to be. 5. Entered trades too late in the wrong direction, so I seemed reversed. 6. Need to stop after 2 costing trades, but at least no more than 3 in a row, especially if I'm more negative. As well as have a positive goal, I should have a goal negatively that I will not exceed. Certainly to have a +$300 goal, having a net negative day of over $800 is not a good thing as that's almost triple my positive goal. One cannot operate a business like that. My goal is $300 for the day. Today I grossed $875. 1. Got in and out of trades quickly, recognizing I wasn't physically feeling all that great. 2. Planned trades. Traded plan. 3. Patient. Allowed patterns to play themselves out to take profits. 1. I meant to set the # of contracts used at one time to 2. I thought I clicked the "1" button twice, but I inadvertantly clicked "10" twice. Not good. Thankfully things went in my favor. After I reset, I was back on track. 2. Did not verbalize trades. Notes: When I got home from my lunch appointment with a former colleague, I decided to trade again. I went in for 2 contracts and was out in a minute with an extra $250. If we look at the overall amount I would've made with just 2 contracts, it would've been $450 today, which exceeded what I planned to do. However, with one contract, that would've been $225, which falls short of the $300/day/contract. Last night as I was getting ready to go to bed, my son woke up feeling sick. In the end, he puked for quite some time and made a mess of things. Thankfully it was all contained to just the bathroom, toilet areas, sink, floor, rug and not the bedrooms, hallways, beds. Needless to say, it still took me awhile to clean things up. He kept getting up intermittently for 2-3 hrs in discomfort. I'm guessing he ate something that greatly disagreed with him and his body was rejecting what he ate. He was screwing around with his foods earlier and I have no idea what he put together, but it didn't look good to me. By the time I could actually fall aslep, I remember seeing it was nearly 4 am. I awoke around 6:30 am to begin getting my kids' lunches, breakfast and things ready for school. Got nauseated in yoga, came home to trade for 3 min., went to a lunch with a friend, traded for 1 more minute as the market was still up, came home to sleep a little, picked kids up from gymnastics, came home to sleep a little more before a birthday party that got canceled while we were sleeping, helping my daughter with her homework, get dinner made, do the dishes, read to my kids, pick up around the house, and do our evening time as a family. Hopefully tonight we can get to bed earlier and everyone stay asleep, no one getting up because we need to or anything. I'm tired. Hope you all are getting enough rest. I am being reminded this evening as I read a book by Elisabeth Elliot on "Purity and Passion". It talks about bringing one's love life under the authority of Jesus Christ. One might think "Why would I even say that here in a trading blog?" The basic premise of the book is to not rush things, but to wait, basically wait on God's timing. Yesterday a trading friend of mine asked me why I did not trade typically bigger contract sizes, since I seem to be overall doing much better than most people. I told him that I was not consistent yet in the small sizes and was still doing undesirable things in my trading which had to be worked out, purified, refined. To do that on certainly larger position sizes would mean certain death. The process of daytrading, my daytrading in particular, is not just a matter of simply pushing this button or that button, but anything psychologically amiss will come out somewhere in my trading. Daytrading really brings out any dross in one's life and you can either ignore it and see your accounts grow smaller, or you can deal with them, no matter how ugly, and eventually see yourself gaining in your accounts, your wealth growing. Having experienced some huge downturns and not knowing how to come back, those emotions of hopelessness, despair, desperation are all too familiar. Remembering what that felt like, and what it took to get there, to go there again knowingly would be sheer madness. I do have a plan of action to reach my goals for the remainder of this year, but, in the end, as I walk with God, I will allow Him to better direct my steps. Sure, I would've liked to already be consistently trading 100 contracts right now, but that's not where I am right now. There is work to be done here and progress is being made. Have not arrived yet. We have to be brutally honest with ourselves, and then take that information and set it before God, lay it on the altar and have Him do with it as He wills, and to be okay with that. Will I ever be debt free, a mega millionaire or more? Those are goals, but I really don't know. I certainly do hope that it is a part of God's plans, if not, as I submit to His authority, He will reveal what He wants of my life and the direction to take. Thus far, it's trading. But, it's bringing my passion for trading into a very pure form that draws me closer to the heart of Christ, as well as using my life to draw others to Him. May you have a very blessed remainder of the weekend. This has been a challenging trading week as I've learned things about distractions, toxic people, negative attitudes, emotional challenges were things that made trading an adventure that showed me some things that I want to or do not want to do. It's really helping me, however, to learn to trade in all sorts of conditions, especially the adverse and to work to get things stabilized, so that I CAN trade no matter what. To be aware, responsible and accountable for your actions can be a real challenge. We want to blame others for our poor choices, but in the end, it is I who executes the trades and no one else. Some tough lessons to learn, but hopefully as I constantly see where I need to work on in my trading, that it will get through my head and I will do it. I'll have to admit, only on Monday did I want to trade, but Tues-Fri, I did not but forced myself as I made the commitment to trade every day (minus holidays). I'm not trading throughout the whole day, so I figure I can focus for the 1/2 hr or hour or so. Have a super week. God bless you all! My goal is $700 for the day. Today I grossed $787.50. 2. Knew were the pivot points were as well as were I was with MAs, various timeframes, RSI, volume, MACD. 3. Step my stops (costs & profits). 6. Planned my trade, traded my plan. 1. My original goal was $300 for 1 contract, but I didn't want to sit here that long and increased my risk. However, I knew where I was and set my stops appropriately. I made $157.50 per contract, so the goal for 5 contracts @ $300 would've been $1500. I'm feeling incredibly groggy and icky, because I broke the latter part of my cleanse day with some poor choices in food (refined sugar) and I'm paying for it today. I figure it was better to get my trading over and done with quicker than to drag it out as that may prove to be more detrimental. Going back to bed. Still, for feeling like I've been drugged, $767.55 in less than 30 min. is awesome. I can tell you I never made that much in one full engineering day for myself. This just goes to show that not only do you have to have the psychological part down, but the foods you eat do impact whether you can think, act and feel correctly. I'll analyze the week a little later. Happy Trading! My goal is $300 for the day. Today I grossed $337.50. 1. Verbalized trades (softly talked) in details and reasoning to stay in trade and not get out. 2. Chose the right timeframes. Started with 15 min, then moved to 3 and 1 min. Moved between 3 & 1 minute charts a couple times to get a better understanding of what was happening in the markets. 4. Traded until I reached my goal, whcih included all commission costs. I had made $312.50, but my commission costs were $19.95 at that time, so I decided to make one more trade to cover the few bucks and stopped after that. I wanted to take $37.50, but I wasn't getting taken out, so I forfeited $12.50 to get out of the trade as $25 would cover all commissions and give me a few bucks over $300. 5. Knew where I was. Location, location, location. What I mean by this was I knew where the pivot points were, as well as on RSI, moving averages, and Fibonacci points are. 6. Calm, clear headed, focused. 7. Turned off Yahoo IM and any communications that would've distracted me. 8. Did not trade until I could focus. 9. Planned my trade. Traded my plan. 10. Recognized I was still not at a great place emotionally and set my goal for today low. 1. Though I was patient, a little more patience could've been used. It's never a bad thing to take profits, however, if you take profits too early, this does cut into how much you take home and perhaps cause you to trade more. Every contract or trade costs money. Yes, it's just a few bucks, but those bucks add up. 2. I was meaning to in one trade get out of the trade and clicked on the incorrect thing and entered a third trade. So, this was accidental. There are ALWAYS opportunities to make money and if I miss, so what? I was waiting to see if something was going to happen and to see if I wanted to move up my limit order, which I did, but instead of dragging on it, I was just going to click on the ladder and place that order. Clicked the wrong side (meant to close a short position) and ended up opening another short position. So far with what I'm doing as I made the commitment nearly 4 weeks ago to trade every day no matter what (I did take off Thanksgiving and the Friday after), I've found 3 of the days have netted negative. One, the commissions exceeded what I brought it and that was a nearly break even day, but technically, it's still negative. It seems every 5-6 days of trading, I end up with 1 negative day in the bunch. Not sure what the deal is. Do I need to only trade 4 days a week? How do I know which one? Friday, Monday and Wednesday were negative days, looking back. When I trade 1 contract, I usually have a higher ROI then if I do 2 contracts legging in. Guess I take profits sooner on 2 contracts and sometimes maybe my entries aren't quite as clean. When I do 2 contracts, I do get in and out of trades quicker. So far, I'm up 316% ROI in 16 trading days. Inspite of some of the things I've done, this is still a fabulous return. Keep in mind, I've been sort of going through some hell with my former spouse, learning how to be a single parent, manage financial disaster, and a bunch of other things. Just A LITTLE bit of pressure, don't ya think? It's interesting the Overall ROI trend. If I continue at this same rate through to the day before Christmas (aka Christmas Eve), that's 15 more trading days, I would be at over 4400% return. I just did the calculations on how much I would need to make each day. That's a bit outrageous, but possible. What I would need to do is be very focused and basically be making around $1K/hr, so this means great focus. This means for the remainder of this week trade with 1 contract and doubling the contracts (not legging in/out) for the next 3 weeks thereafter, so on Christmas week, I'd be trading 8 contracts at a time, as if it was one contract (no legging in/out). This is all conjecture and I've not done that in futures YET. It seems like I've been on the 1 contract for quite some time, but to really grow accounts exponentially, one needs to trade with more contracts. It would definitely mean trading for at least an hour a day, maybe closer to 2 hours on some days. 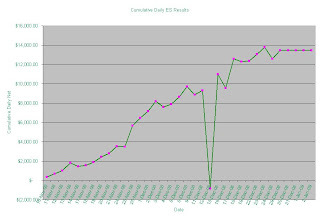 So, it's possible in 31 days of trading, or 7 weeks and 2 of them being partial trading weeks, to get over a 4000% ROI. That would be amazing, because that means trading every day. That isn't luck. If you hit the jackpot on one trade that is 4000%, that doesn't mean you're a good trader. Even 7 weeks with this kind of return doesn't mean one is a good trader, but it is a good start. Anyway, it's nice to dream. Let's get back to trading, making each trade count and making good trades each time, keeping profits high and costs low. Take one day at a time. Today I decided since yesterday was a psychologically rough trading day for me (the market was absolutely beautiful, though), that it was best to get back down to the basics and go back to my $300/day goal. Also, there are some person things going on from the past that are fairly negative, so it was best to lay low and not expect a great deal from myself. Guess I held true to that, unfortunately. My goal is $300 for the day. Today I grossed -$537.50. 2. Traded my plan for the first 3 trades, which were all profitable and just about hit my goal. Just going to do one more trade. 3. Kept my risk low by trading with only 1 contract and resisted the urge to trade more. 4. Stopped instead of further going on, after about an hr. 1. Turn the damn Yahoo IM off so no one can contact me during trading hours. Sorry for the language. I've found when a certain person contacts me and starts in with his negative crap that is anti wall street, big business, capitalism, political sh**, it puts me in a super negative mood. I so far have not been able to master separating myself YET. His verbiage is just foul and taints my trading and every time he starts in, I always end up negative for the day. All I needed was one more trade (the 4th trade) to make my goal and cover commissions. He interjected his poison and that cost me. As I attempted to recoup, I wiped out all my profits. Thinking I could do similar to yesterday, but only going to use 1 contract and keep my risks low, I did stick with that. Anyway, I kept getting more further negative than really making too much headway positively. 2. Could not get those damn words, "idiots on Wall Street" out of my head. Guess I traded like an idiot, doing things the opposite of the market, and not going with the flow. I allowed his very negative venomous vibes to poison my trading. 3. Have 5 costs in a row. Should've stopped after 2 in a row to analyze my trades. 4. Was distracted with a phone call. 5. Did not verbalize most of my trades. 6. Need to stop trading when I can't get negative messages out of my head and do something to clear my head. The market doesn't really give a crap about anyone. It isn't out to get you. I keep hearing that the market is bad. The market is neither good nor bad. It is what it is. As I'm watching the last 1.5 hrs of trading of the normal equities trading timeframe, the pattern of the market on the 3 min. is simply gorgeous, beautiful. I traded for less than the half the 6.5 hrs of the equities market and made what some people would've made all year in less than 3 hrs. Of course, it was practice, though, real time and everything would've been the same in my real account. I also gave most of it back in commissions and costs because of not getting a grip on my emotions. Having a good trading plan and being able to execute it precisely is very important. As humans, we often have hope, and that really can kill a person in trading. I was doing moderately well to begin with, then a trade turned against me. Rather than take the cost which was more than I would've liked, that cost became bigger. Oh, another faux paus was that I did not have an appropriate stop in place. As much as I'd like to blame my children for being very distracting, it was I who chose to continue to trade amidst the distractions. I could feel my blood boil as I watched the clock and my kids still had food all over the dining table, partially eaten, playing around in the bathroom, didn't have their stuff together for school and we needed to leave in less than 5 min. I was still stewing about some things about my former spouse that transpired in the past few days, those recurrences. Instead of letting them go and chock it up to him, the former controlling self wanted to assert herself, her rights to be offended. That's never a good thing, as it doesn't hurt him or anyone else but myself. Actually, it has had a fairly negative impact to my children and to the environment of our home. I had gained some victories in some spiritual arenas of my life, but right now I don't feel like I've gained anything but taken a number of steps back. It's very humbling. Not that I was prideful about those victories, but it was nice to overcome some huge things and I find as I begin to reach the next level, other things pulling me back, and me allowing it. The market is AWESOME every day. The question is, do I (or you) have your act together enough to be able to trade? In order to effectively trade, you really need to come to the table with a clear mind, focused, undistracted. The goal here isn't to make a million today, but enough to meet the needs of my family and to continue to add to my accounts, to stabilize things. Once I've done that very well for awhile, then I can move onto the next thing. It's been about 5 months since my divorce and I'm still dealing with some challenging issues that I have not learned to master. Perhaps my expectations are too much, but they are still goals and things I must overcome. Everybody has crap that happens, so I must become a master of dealing with interferences, as Dr. David Cook, a sports psychologist talks about. The market is never out to get you, unlike what most people think. If it can continue to sell, it will. If people see things at enough of a bargain, they begin to buy and keep buying. If it gets too pricey, they stop buying. It's really that simple. Does the market really care about my typical 1-2 contracts? Not at all. As I write this, at 3:07 pm EST, over 2.1 million contracts have been traded on the ES with another hour left of trading futures for the day. 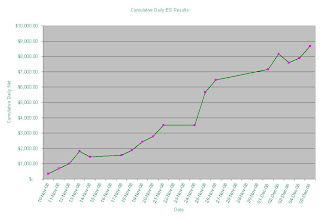 Today I traded 1917 contracts total, with a magnitude of almost $88K (profits + costs) in about 2.75 hrs of trading. Do you think the market really cares? That ends up being about $46/contract of movement. If we equated that to the 2.1 mil contracts, that's almost $97M in the ES for 2.75 hrs of trading. There's certainly even more money than that that is generated as I wasn't trading for every single minute. Anyway, this is just a guess as to how I personally traded, and is not really reflective of the whole market. People take it personally that they get taken out of their trades or the market is working against them. What causes one person to be able to make lots of money and someone else to not? As we look at my own trading, when I'm focused, undistracted, emotionally stable, clear mind, I do usually have 80% or more of my trades are profitable. When I'm not, it can be a bad thing. It's not because the market treated me well, it's I decided to play this game that I wasn't equipped to give myself the best chance to do well. It's like blaming food made you fat. Overeating and eating the wrong foods and a host of other incorrect choices made you fat. All of this requires that we each take FULL responsibility for our actions, not blaming anyone else. Notes: Today I did not trade with real money as I was very angry, but even when I practice, one needs to trade as if it were in real life. I made major faux paus today of the grandest scale. Not good. My goal is $300 for the day. Today I grossed $48,200. 1. Verbalized some of my trades. 6. Got out of trades that went against me fairly quickly. 1. Traded in the middle of a chaotic environment. 2. Traded when I was very angry at several things, more in rage. 3. Did not trade my plan. 4. Took too large of positions. 7. Greatly increased my risk exponentially. 9. Kept trading in a fury, even when things were very against me. 10. Failed to look at bigger timeframe often enough. I traded mainly on the 1 min. timeframe since I was very high strungly angry. 11. Issues need to be resolved when coming to trading. The money I need to generate can be made fairly quickly, but because I was down so much, I had to make up for it and kept trading. Anger is a very strong emotion. IF left uncheck, it can be quite damaging. Anger can also be contagious if we are emotionally wounded. Today is a case in point. At least today I recognized that trading with real money was not a good thing, so I did not. And, it's a very good thing I did not, as it's truly been disasterous today. I was able to recoup the money that was literally "lost" in the market. It was a loss and not a cost as there were many things done that I would not do in real life. There were a myriad of things I was very angry at, and really lost control. Instead of appropriately setting aside my trading until I dealt with my anger, I continued to trade. This was not a good thing. In turn, I made choices that I would not have otherwise. You know those things. Now you're way down and what are you going to do to get that money back? Yes, you take chances you would otherwise not take under normal conditions. Though I ended up in a net profit today of a little more than my goal of $500, most of my profits went to either costs or commissions. I don't have time to post the results, but I basically traded for about 3 hrs. My results are BRUTAL and I definitely need a time out. I'm done trading for the day and greatly need more time with God and for people to pray for me, to shake this bad attitude off me. My goal is $600 for the day. Today I grossed $875. 1. Verbalized trades, even though it was a whisper. 4. Stopped trading when I thought I reached my goal for the day. 6. Saw trading from the big picture as well as the smaller timeframes (used 1, 3, 15, and 60 min. timeframes). 1. I set to take profits sometimes too soon, rather than just waiting. 2. There were better times for me to get in, like at the retracements rather than the breakout. This led to decreased profits, but greater confirmation of the move. 3. One of the costs was because I forgot to take the full order off the table when that position closed, so the reverse happened and I wasn't paying attention, so that one cost me $100.